If you need to get anywhere, you need a “Lammy”. These I.D.s are always worn by media people while on the job. The expensive ones have the user’s photo and some even have an RFID chip. The Oscars are very cautious in keeping their credentials safe and do not allow any photos of the current I.D. 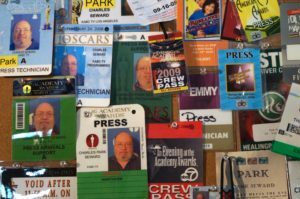 In fact, if photographed, the Academy will pull the credential and remove you from the event and you will not be allowed to cover the show.